The hybrid drum kit, combining electronic elements with regular acoustic drums, is an increasingly popular concept, particularly with current music styles and production techniques that draw upon an ever-more diverse and eclectic range of sound sources. 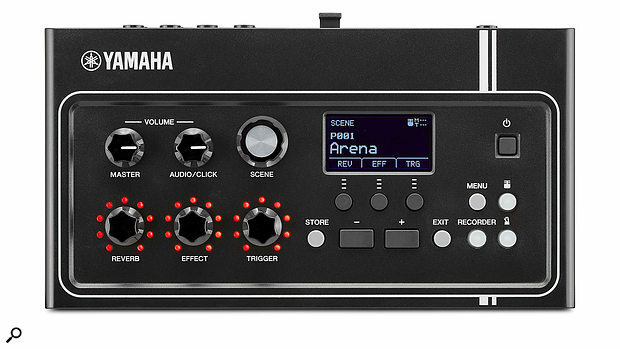 Yamaha’s EAD10 is described as an ‘Acoustic Electronic Drum Module’ — a hybrid drum module that combines the natural sound of your acoustic kit with effects and electronic sounds. That’s quite an intriguing proposition, and suggests it might be the answer to a scenario that often involves a lot of equipment, cabling and technical know-how. Once you include the fact that the EAD10 can also record your performances, integrate with your DAW and help you create YouTube clips, you might suspect that it’s a bit of a jack-of-all-trades — but does it master any of them? The ‘System’ comprises two parts: the Main unit, or ‘brain’, and the Sensor unit. The Main unit deals with all the sound processing, samples and effects, while the Sensor unit provides an audio signal captured by its two on-board microphones and a trigger signal from the bass drum. The fairly weighty Sensor unit has an all-metal construction and feels very solid. Its slightly odd shape enables it to be fixed to the hoop of your bass drum and secured with a single knurled chrome knob. (If you’re familiar with using any bass drum triggers, you’ll know the kind of arrangement I’m talking about here.) At around three inches square, it fits snugly against the hoop and is in no way intrusive when playing. The Sensor unit clips unobtrusively to the rim of the kick drum. Built into the Sensor unit is a trigger that picks up the vibrations from the bass drum. In addition to the trigger, a vented grille section at the top of the unit houses a stereo condensor mic in an X-Y configuration that picks up the acoustic sound of the drums. The only other visible features are the two jack sockets on the rear of the unit (labelled A and B) that send the stereo mic signal and trigger signal down the provided cables to the Main unit. This second unit is a somewhat lighter affair constructed from black plastic with a very nice matte finish. The left of the unit features six black, retro-looking, knurled plastic knobs in two rows of three. The upper row controls the Master volume and Audio/Click volumes, with the last knob used to select presets (Scenes). Reverb level, Effect level and Trigger level are controlled by the lower three knobs, each displaying its current setting via its own circle of red LEDs. A fairly small LCD screen is located toward the centre of the unit, beneath which are three ‘soft buttons’ that relate to whichever parameter appears above them on the display. Two large +/- buttons sit below, with smaller Store and Exit buttons either side. Finally, to the far right are the Menu button, Sensor Unit button (for instant access to the mic and trigger levels sent from the Sensor), a Recorder button and Click button. Neatly located in a recess at the front of the unit is a standard quarter-inch headphone socket. The rear panel hosts relatively few inputs and outputs for a drum trigger brain. Four physical trigger inputs are provided in total, marked out as ‘1 Kick/2’ and ‘3 Snare/4’, ‘5’ and ‘6’. Both the Kick and Snare inputs can potentially accept two trigger sources if you use a Y-cable or a dual snare trigger such as the Yamaha DT50S, which can trigger the rim and head independently. Trigger inputs 5 and 6 both support any of the DTX-series three-zone pads. I’m sure other pads and triggers will work, but potentially not with multi-zone functionality. Below the Kick trigger input (also marked A) is input B, which accepts the mic signal from the Sensor. So for basic operation and with no additional triggers, the Sensor unit is simply connected to the A and B inputs with a dual quarter-inch jack-to-jack cable. Left and right outputs are provided on two mono quarter-inch jacks with an aux input on a standard mini-jack socket for external play-along sources such as an MP3 player. Other than the 12V PSU socket, the only other I/O on the rear of the Main unit is two USB ports: To Device and To Host. To Device is designed to accept a USB flash drive for direct performance recordings and the saving of presets. The To Host USB port connects the EAD10 to your Mac, PC or smart device such as an iPad or iPhone. With everything set up, plugged in and ready to go, I thought I would check out a few of the 50 preset kits (Scenes) for some instant gratification, before delving a little deeper. Once you’ve switched on the Main unit, the current Scene name and number are displayed in the centre of the LCD, while a small indicator shows the level of both the mic and trigger inputs in the top-right corner. If either of these appears too low or high while you’re playing, pressing the Sensor unit button allows you to adjust input levels manually using the +/- buttons, or automatically by selecting the Auto soft button and playing around the whole drum kit for about 10 seconds. Preset Scene 1, ‘Arena’, gives you that instant ‘on stage at the O2’ sound, adding a large reverb to the mics and layering a 22-inch Maple Kick with your own kick, via the kick-drum trigger. Fast tweaking of the Scene is made very easy with the dedicated Reverb, Effects and Trigger knobs, raising or lowering the level of each element of the sound. Moving through some of the other preset Scenes, more colourful effects such as phasers and flangers are introduced, giving a sweeping, psychedelic sound to the kit that changes with the dynamics of your playing. Scene 6, ‘8th Note’, applies delays to the kit, to great effect, and definitely brought out my inner Stewart Copeland! All the kits are well balanced, with just the right amount of delay or compression on each individual element of the drum kit. This is, in part, down to the EAD10’s DSP, which takes the mic signal and divides it into frequency bands that are intelligently routed through the internal effects. So far I had only used the Sensor unit with its built-in bass-drum trigger, but the EAD10 can accept up to five additional triggers, to play more electronic sounds alongside the acoustic elements of the kit. I added the Yamaha DT50S trigger (available separately) to my snare drum. Although physically a single unit, this actually contains two discrete triggers, one from the drum head and one from the rim. A number of the preset Scenes provide for an extra sound controlled from the snare trigger input, so I first tried those out with the newly added DT50S. Like all the other features I’d tested to this point, it was a case of simply plugging and playing — everything just worked. The ‘Dance 8’ Scene now included an 808-style clap alongside the booming 808 kick drum, while the already fantastic sounding ‘Calf Heads’ Scene mellowed even further with the addition of a subtle tom sound under the snare. Fortunately, the majority of the preset Scenes are very useable and focus on altering and augmenting the drum kit sound in practical ways that you’re very likely to be able to use on a recording or performance, whether you choose — for example — ‘Metal Kick’, with its harsh, layered kick and snare voices, ‘It’s 1985’, offering a classic gated reverb sound, or the inspirational ‘Vinyl Loop’, a very convincing retro-sounding kit, compressed and EQ’ed, with a scratching record sound layered underneath. Two hundred user Scenes are also provided, which can be created by modifying an existing preset and saving it in one of the user locations, or by selecting a blank user Scene and creating from scratch. From any preset or user Scene, the three soft buttons below the display take you instantly to the Reverb, Effect and Trigger edit pages, making it very easy to quickly change the settings. No fewer than 527 of Yamaha’s best drum and percussion voices are included in the EAD10, organised into seven categories: Kick, Snare 1, Snare 2, Tom, Cymbal, Perc and Effect. Any voice can be quickly and easily assigned to any of the trigger inputs. Each drum voice can also be edited in a lot more depth than I had expected: parameters include Tuning, Decay, Pan, Voice Filter Cutoff and Voice Filter Resonance. As if that wasn’t enough, you can import 100 of your own samples via the USB port as 16-bit WAV files with a maximum length of around 20 seconds, and save them in the EAD10. This is a great feature for adding unique samples such as vocal phrases or specific drums and percussion to a live performance. When it comes to signal processing, the EAD10 doesn’t fail to deliver, with 11 high-quality reverbs and 21 other effects including delays, distortion, compression and dynamic modulation (flangers and phasers). Individual sends and returns are provided for both the mic signal and the triggered voices, so each element of the overall Scene can receive its own level of reverb and effect. 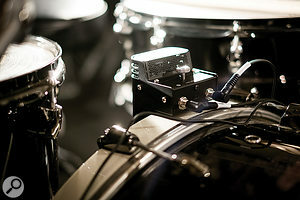 The EAD10’s I/O comprises a quarter-inch footswitch socket, USB A and B ports, quarter-inch connections for the sensor unit, the four trigger sources and the audio output, and a 3.5mm aux input. The EAD10 can record your performance either directly into the Main unit or, for longer performances, to a USB Flash drive. Internal recording is limited to around 90 seconds and is lost once the Main unit is powered off, but the USB option can record up to 30 minutes. In addition to playing along with the built-in metronome, you can also import MP3 and WAV files as an accompaniment to your playing. Once they’re imported, you can play along and ‘overdub’ your performance onto the backing track with the complete ‘mix’ saved to the USB drive. The internal recording function is certainly a useful feature for practice, but my next step was to integrate the EAD10 with my DAW, in this case MOTU’s Digital Performer 9 running on a MacBook. Just like everything that has gone before, it really couldn’t be simpler. Plug in a USB cable between the EAD10 and Mac and you’re done; no drivers, no installation, no fuss. The EAD10 showed up immediately as an input option in DP’s audio tracks. The USB output is a stereo mix of the microphone signal, effects and triggered sounds, mirroring the audio output of the physical unit. In addition to the audio, the trigger information from the EAD10 is sent to the DAW as MIDI data, so you can assign a MIDI track and record both the audio signal and trigger data simultaneously. Initially I chose to record just the mic signal, so I turned down the Reverb, Effects and Trigger on the Main unit. In this scenario, even though the triggered sounds are not appearing in the audio mix, the MIDI signals from the performance are still transmitted to the DAW. The stereo mic configuration produced a very impressive result — everything was nicely balanced, with a good stereo image. The kick drum had plenty of thump and the snare also had good presence. If anything, the toms lacked the body you would achieve with close mics, and because of the way I have my kit set up the ride cymbal was a little overbearing, but overall it was an impressive sound. By adding a little EQ, compression and reverb, I was able to create a very useable drum track that wouldn’t sound out of place on any recording. In addition to the audio, I also recorded the trigger data from the EAD10 as a MIDI track in DP9, so I was able to assign the kick and snare parts to samples, in this case from Superior Drummer 3. This enabled me to augment what was already a great-sounding drum track with external samples and manipulate that in any way I wanted. Creating a great-sounding drum track was an absolute breeze, with no multiple-mic setups and no MIDI or audio interfaces. Even though I’m in the fortunate position of having a studio where my drums are set up and permanently close-miked, I instantly saw the attraction of the EAD10 for practice, performance and recording. As a practice tool, it’s perfect. Take two boxes, with very few wires and minimal setup, and you’re able to play along with backing tracks or a metronome mixed with great-sounding drums. The presets are huge fun and certainly offer instant gratification. The majority of the preset Scenes are ideal for playing along to tracks, and many of them offer real inspiration when it comes to creating interesting drum parts. The editing potential is a lot more extensive than I expected — the ability to edit the internal drum sounds, and apply reverb and effects to the mics and triggered sounds independently, makes the EAD10 far more than just an ‘effects box for drums’. Integration with a DAW is simple and produces excellent results. Of course, it does lack some of the body and warmth of a close-miked kit, and you’re limited to a ‘mixed’ stereo track, but having the option of triggering a replacement kick, snare and potentially two toms via the MIDI tracks opens up enormous post-production possibilities. The only addition I’d like to see would be individual outputs for the mic and triggered sounds, so that the signals could be balanced and effected differently by an FOH engineer in a live scenario. To return to my intro, the EAD10 is certainly not just a ‘jack of all trades’. Everything it does — and it does a LOT — it does extremely well. The sound quality, features and functionality are exceptional in pretty much every area. For under £500$499, it achieves results you’d be hard pushed to recreate with dedicated separate units and a pile of unwanted cables and confusion. To coincide with the release of the EAD10, Yahama have introduced the Rec ‘n’ Share app (Free from the App Store — iOS only). Although it’s not uniquely linked to the EAD10, the app does integrate very well with the hardware via USB, using the Apple Lightning to USB Camera Adapter (or equivalent). The app allows you to import any track from your music library (iTunes, Dropbox import, etc.) and play along to it. Nothing very impressive about that, I hear you cry. OK, but what if, when you imported the song, the app analysed it and applied a click track with a count-in to it? A little more impressive? I certainly thought so when I imported four or five songs and found the app nailed the tempo and gave me a perfect click track. There were the odd few songs it struggled with, and in a couple of cases I ended up with an ‘inverted’ click, but overall the results were very impressive. 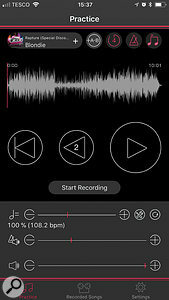 In addition, the app allows you to slow down or speed up the track (while, of course, preserving pitch) and also to create A-B markers to loop a section of the track, so you can listen to and practice one particular part of the song. Of course, the click is following slavishly with every twist and turn. Finally, when you’ve perfected your performance, you can record the output of the EAD10, complete with triggered sounds, reverbs and effects, directly into the app. But it doesn’t stop there. 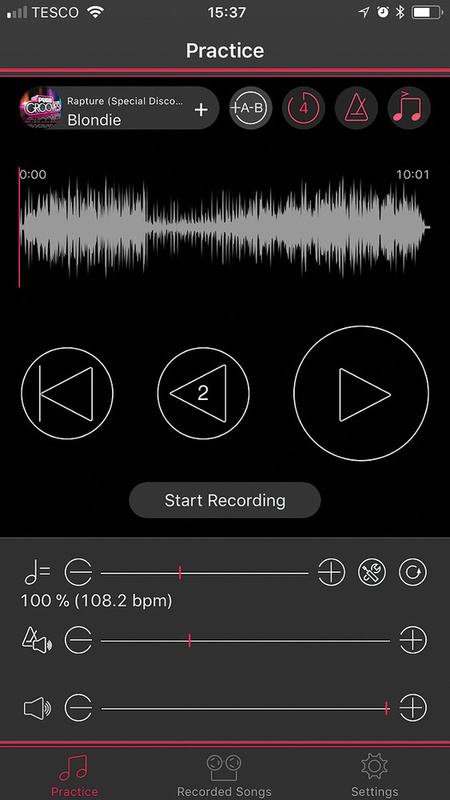 The recording function of the app includes video, so you can create your own performance video with high-quality audio straight from the EAD10. Once recorded, you can balance the drum track against the song to your liking and render the project for uploading to YouTube via a single button press, or simply save it to your photo library. The Yamaha EAD10 could well be the one-stop solution that many drummers have been looking for, incorporating mics, triggers, samples, effects and DAW integration into a very simple-to-use package. Hits the spot.